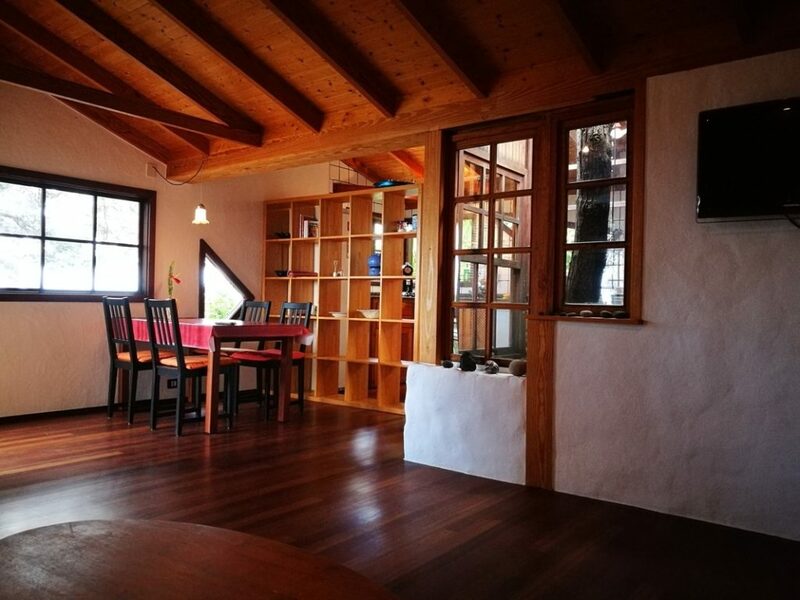 Loft for 2 persons in La Palma / Canarian island. Best climate. Sea view. Lots of SILENCE. Lots of privacy. The perfect all-round renewal retreat for everyone. Experience magical moments during nature coaching walks with Annette. Every 2nd sunday of the month 11 a.m. to 3 p.m. from 2 persons. Are you ready for our beautiful magic island? Do you need time out from your stressful life? A space for you to review your life, for new inspirations and visions? And are you looking for your perfect holiday home on La Palma? 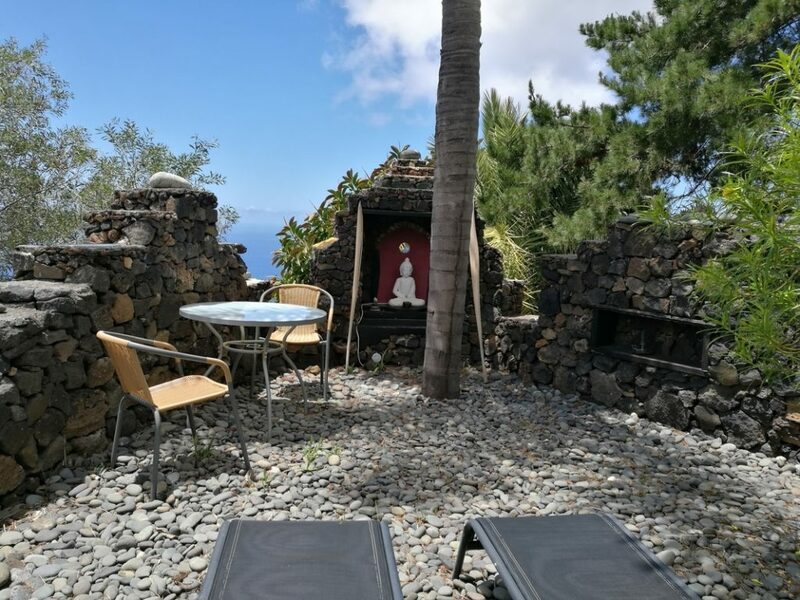 We rent the Casa Saraswati, a cottage for 2 people in a Buddhist atmosphere with spectacular sea views surrounded by nature and SILENCE , in a lava desert. You are invited to book it for a personal retreat, for a yoga retreat or a bodywork retreat. In the Buddhacasa which is adjoined, the Naturopath Annette Harnisch offers bodywork, massages and yoga. She offers “ tailor-made all-round renewal “ for body & soul for everyone. Simply magical. Simply pure nature. Just BEING who you are. This Lush Green Volcanic Island has proven itself for Therapeutic Processes and Health retreats. With its incredibly diverse and beautiful nature and well-developed network of hiking trails, spared from mass tourism, it is the dream island for nature lovers, artists and individual tourists. Experience magical moments during nature coaching walks with Annette, or in the slow-flow yoga experience on the rooftop with magical insights and panoramic sea views. Discover your innate Buddha nature during a day retreat meditation. Travel with the sounds of Tibetan singing bowls into other dimensions of your BEING. Simply magical. Simply pure nature. Just BE your natural self. 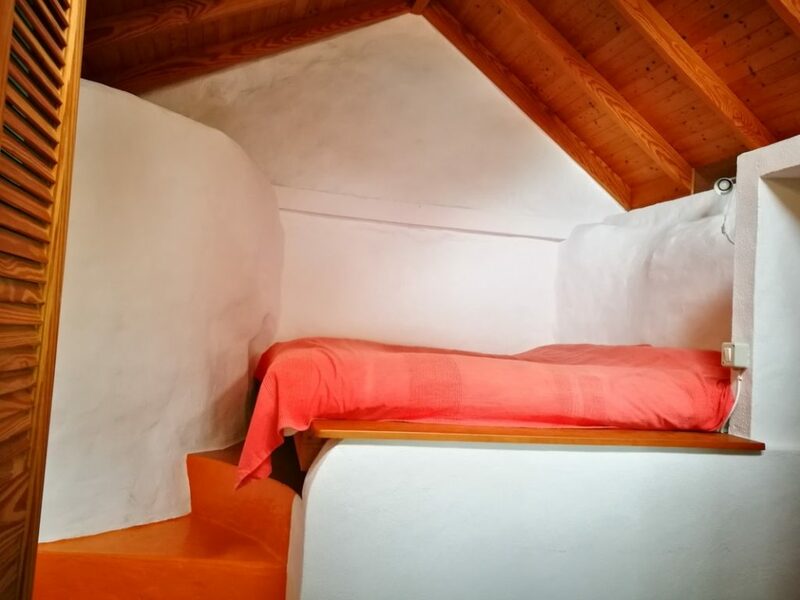 With the Casa Saraswati, named after my Self retreat accommodation in Tiruvannamalai (India), we have created a domicile for those who need a peaceful and very quiet place to reconnect with your inner Being. 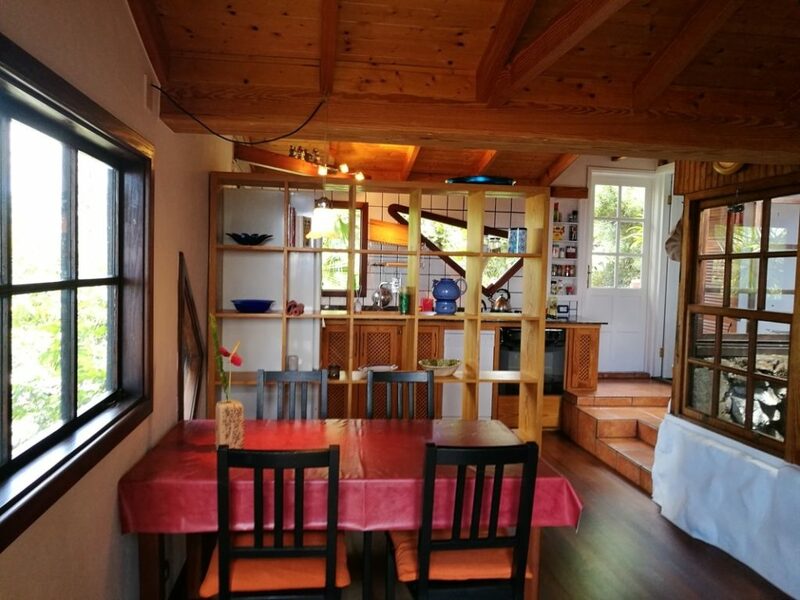 … An individually designed loft (= one room house ca. 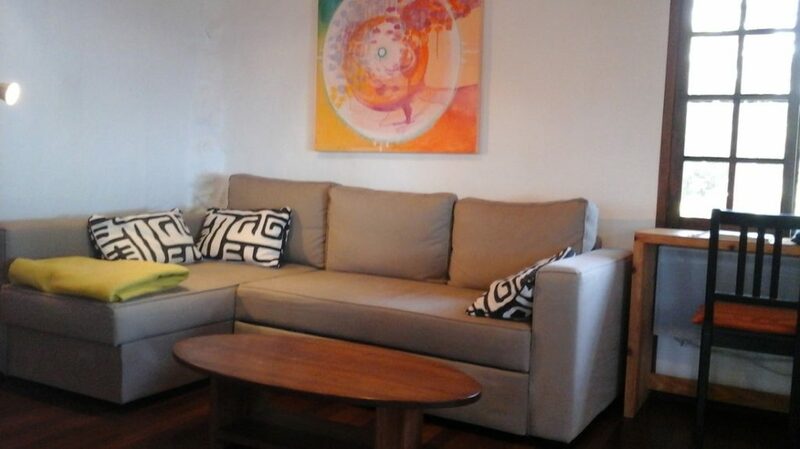 55 sqm) with a breathtaking panoramic view of the Atlantic, the mountains and the sunset. The separate wooden house, with its own wind-protected garden for sunbathing and meditation. 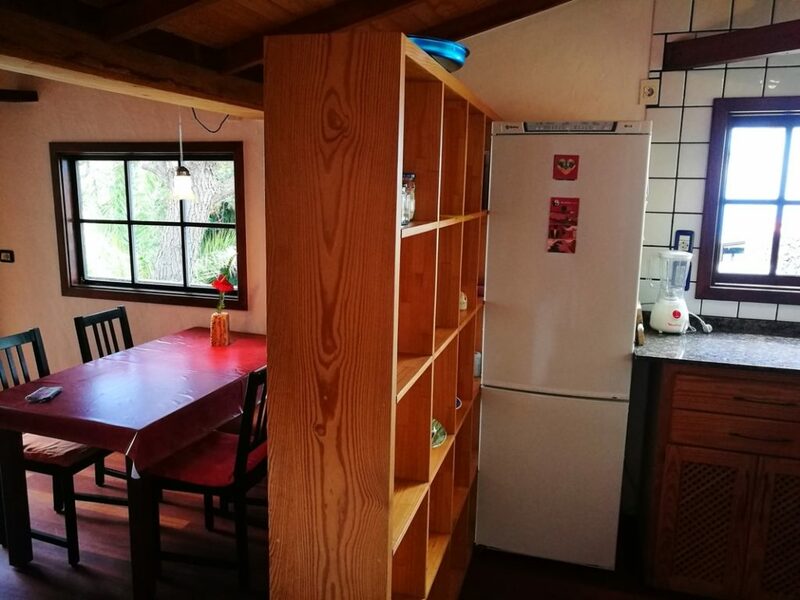 Private access, is located in the middle of lava fields near the nature reserve , the Tubo Volcanico de Todoque Las Palomares, in a very quiet location (no street noise). It has a living area with sofa bed for chilling, satellite TV, staircase 5 steps up to the sleeping area with bio-futon (1,80 x 2,00m medium soft with bio-latex core). It can be separated from the living room by a curtain. 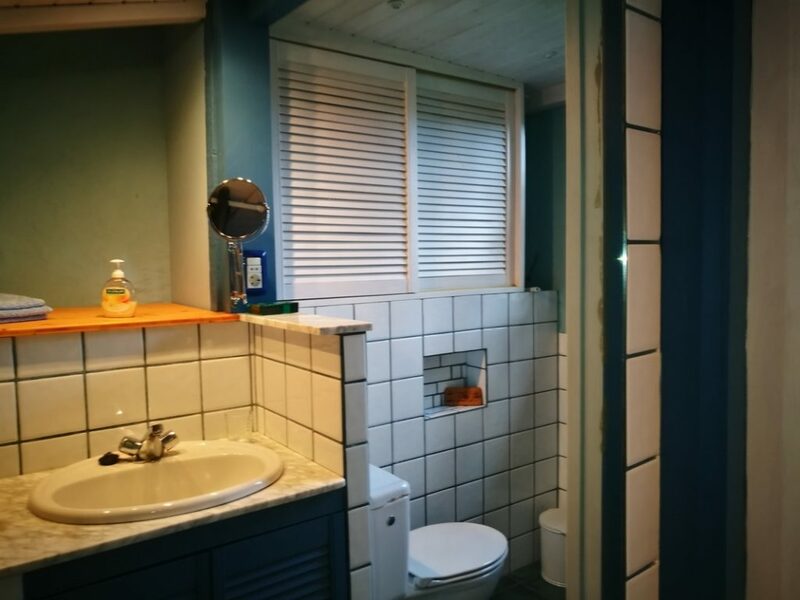 Bathtub (70 cm x 120 cm), shower and WC, a furnished wooden terrace with sea view. Windows with beautiful views to the south, west and north. 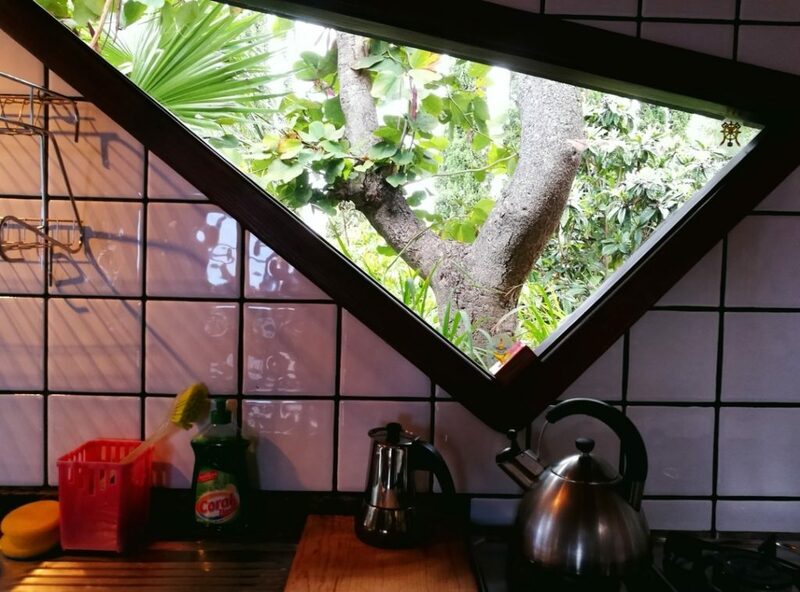 In the middle of the house there is a tree surrounded by windows which adds fresh air and light. 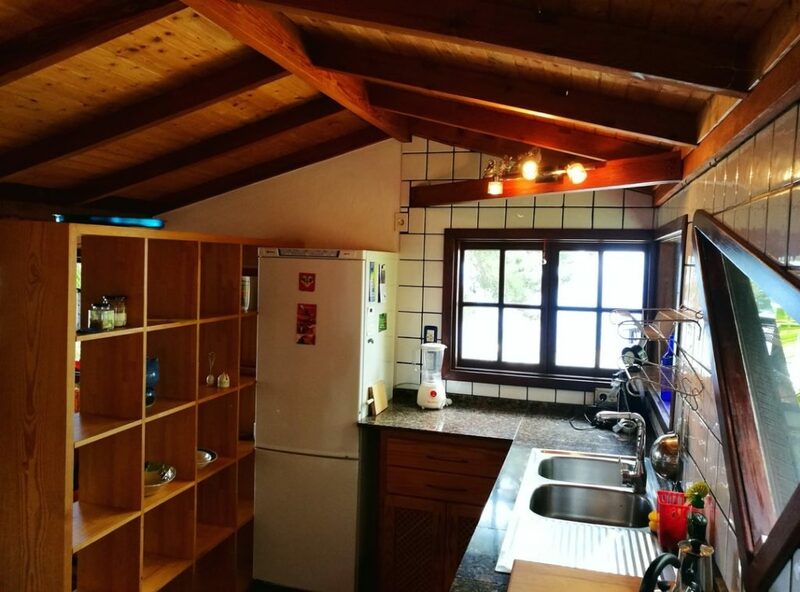 The well-insulated optimally climatized House made from wood is very comfortable in winter and summer. We only use organic colors and gentle EM cleaning agents. Please only smoke outside. Please use ecological dishwasher tabs for the dishwasher. 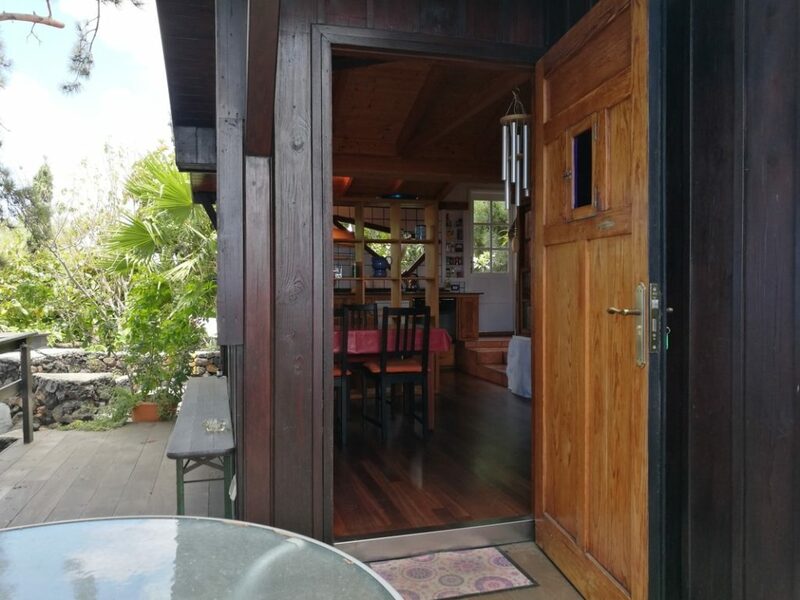 There is a wooden terrace under a shady Canary pine, with your own wind-sheltered garden for sunbathing, reading, having breakfast, barbecuing and a beautiful sea view. To avoid misunderstandings, the round yoga roof terrace does NOT belong to Casa Saraswati. If you want to do your own exercises in the morning between 7:00 and 9:30, you can rent the Buddhacasa for a few hours or do it on your own terrace. Electric heating in the living room and bathroom, from 8 am to 11 am and 6 pm to 11pm. more towels or bed linen for a fee = washing machine, NO self-service! Right next to the Buddhacasa in a green Oasis amidst a lava desert in the nature reserve between Las Manchas de Abajo and Todoque, Las Norias. At an altitiude of 380m above sea level in one of the best climatic zones of La Palma. Absolutely unobstructed panoramic view of the Atlantic and the neighboring island of El Hierro. Impressive view of the mountain chains in the north and east and so much meditative SILENCE… You can hear your heart beat! Conscious Consumption … We reserve rental cars for you at a local car rental, so we can help you if there are any problems. Download the price list … Auto Ferraz 18 Auto Ferraz 18 so you will know where to go at the airport. All inclusive means: Inclusive 2nd driver, insurance and I.G.I.C. Let us know which group A, B or C … Of course you will receive your car at the airport. For this we need your flight number and arrival time. 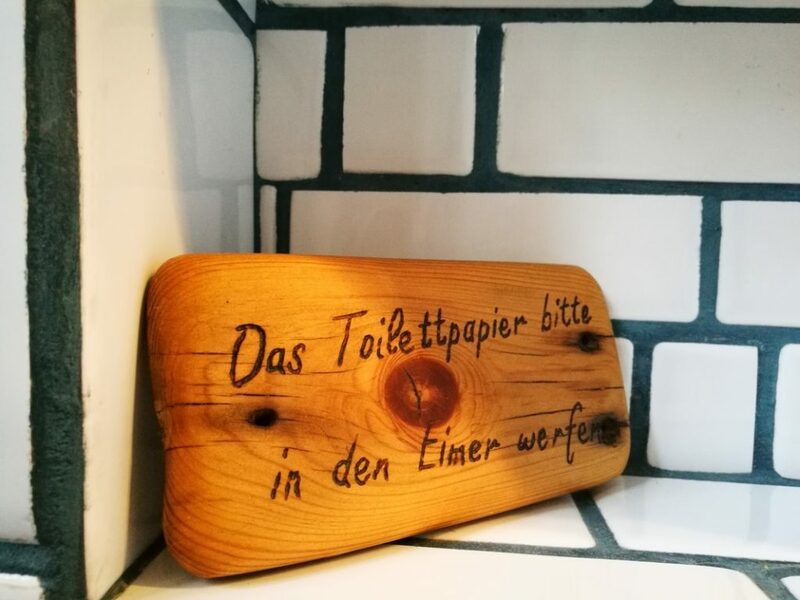 It is an eco-friendly house, we ask you to save water and electricity and use ecological detergent. The loft bed has no barrier, please take care not to fall. Not suitable for small children, only for babies and children over the age of 15. Pets are not allowed, we have 2 cat ladies. An Ayurvedic cure incurs additional costs. By plane from various airports to Santa Cruz de La Palma (SPC) or Tenerife South (TFS) and further from the North Airport (TFN) with Binter or Canary Fly. Attention the airports TFS and TFN are 1.5h taxi ride or 2 to 3 hours apart by bus. Or with the ferries of Fred Olsen or Naviera Armas. Airfare from about 100 € return. From the airport call us when you have landed and drive to the meeting point at Plaza La Glorieta at Las Manchas De Abajo. Lutz will pick you up and accompany you to your holiday home. Because of the remote location on the reserve (Protected natural Park) we recommend to book a rental car. We arrange rental cars with our partner company. 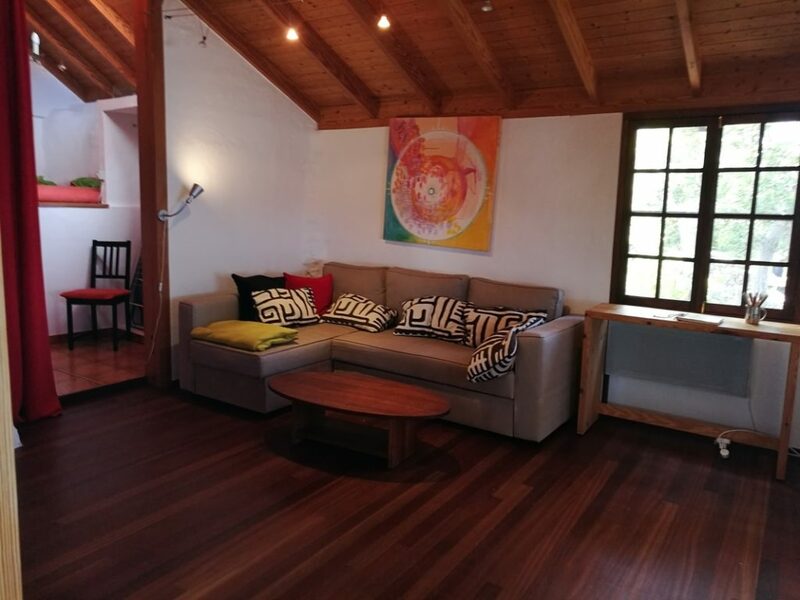 The special feature of our retreats are the many years of professional experience of Annette Harnisch, the perfect place for a break in STILLNESS and the absolutely individual care, as we have no other accommodations and do not offer group retreats. Feel free to stay at Casa Saraswati for another week after your retreat, or customize your yoga and treatment appointments, for example, for 5 yoga and treatment days spread over 2 or 3 weeks. Most health retreats can also be booked individually, without you having to stay at Casa Saraswati. Maybe you prefer traveling with your family, would rather live in a villa with pool or camping or our house is already fully booked. All this should not be an obstacle to book your personal yoga classes. 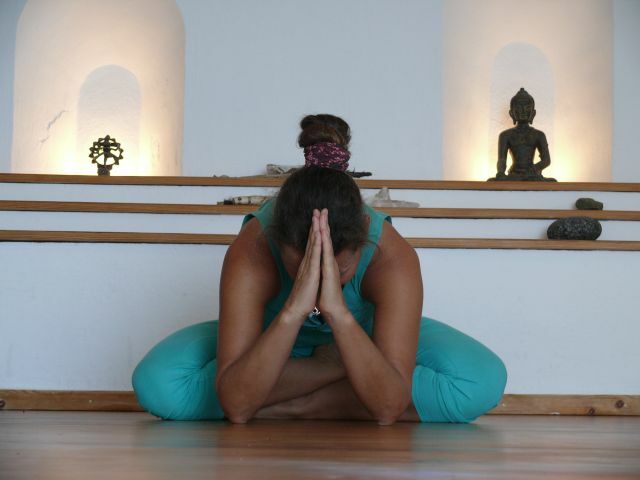 Plan your next yoga retreat in La Palma NOW! For early bird booking only …The International Yoga Groups take place in German, English or Spanish. Depending on which language most participants understand. When booking, please include your languages, most of the time the international groups are in English and the local groups are in Spanish. Daily from Monday to Friday 9:00-10:30h (bookable from 2 people, if you book 3 months in advance!) Yoga mats rental included. This retreat can only be booked without accommodation. 10 x 90 minutes individual Slow Flow yoga session, optional with guided meditation or spine yoga. The yoga class takes place from Monday to Friday, the exact dates you can choose individually. The earlier you book, the more dates will be available. BodyCoaching is a effective combination of body work, energy work and psychotherapeutic coaching…. BodyCoaching is a effective combination of energetic body work, light work and psychotherapeutic coaching. The healing effect from hawaiian healing Lomi Lomi Massage combined with the healing properties of Lava stones from La Palma island. Optional combined with matrix crystal healing. On the massage table or on the shiatsu mat possible. A Retreats whith this massage is a good alternative to the real Ayurveda cure because of its healing effects without elaborate preparation. … relax into every situation, LIVE your essential power. The Yoga with Cognition experience… For gaining enlightenment and inspirational ideas. Flowing with the breath and being conscious without attachment and judgement. In each cell of your body are the keys to more holistic health, more vital life energy and true happiness. Yoga with Annette Harnisch is not a wellness event – it is about to BE conscious. Since 1983, Annette Harnisch continuously develops her yoga style. In this way you could say that SLOW FLOW YOGA is a combination of Yin Yoga, Vinyasa Flow, Qui Gong and Buddhist meditation. With techniques from Hatha Yoga and Meridian Yoga, we bring the energy flow of the meridians / Nadis and thus all organ systems into balance and support our body in self-healing. We nourish our soul, clear our mind, come to a better attitude in many ways, learn to recharge our batteries, let go and become more relaxed. We relax into every asana (= posture) and with exercise in every situation. The Slow Flow Yoga style has its focus on · mindfulness and the awakening of the body consciousness. Not as super-gentle as some yoga teachers of the Power Yoga believe – you will have sore muscles! We work with the consciousness, the emotions, meridians and fascia, straightening the spine and the whole person, and if necessary also with meditation …I will invite you to reduce the over-worrying and thinking dysfunction that causes stress and to open to a deeper state of awareness and sensitivity to enjoying the life moments by connecting you to your breath and body. What is the Slow Flow Yoga with Annette Harnisch about? It is about nothing less than your true essence, your potential to awaken your true Buddha Nature. Slow Flow Yoga allows us to overcome our toxic emotions, prejudices, and useless negative thoughts and habits over time. It releases us from stress and gives us PEACE IN THE HEART so that we can discover, awaken, and be connected to our true nature. The misconception of ourselves is the root of all our problems. Slow Flow Yoga is detox for the soul and helps you to overcome all obstacles to your personal and spiritual progress. The Buddhacasa is a consecrated temple with stupa in the tradition of Tibetan Buddhism and is suitable for small Yoga groups up to 5 people and healing space. Annette Harnisch is a trained yoga teacher and has been practicing Vipassana meditation to Goenka since 1983. 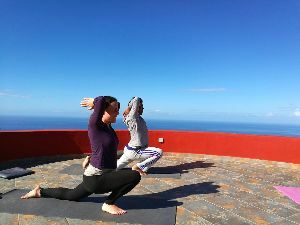 Annette has been giving local yoga groups and international retreats for couples and individuals for more than 20 years on the holiday island of La Palma. She has been training since 2014 in the „Centro internacional de estudios budistas“ in Denia / Spain and received her certificate as a meditation teacher in September 2018. 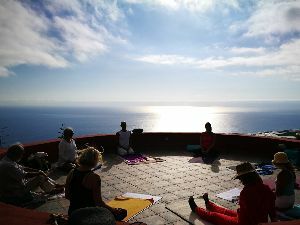 With the unique Yoga Retreat with Annette Harnisch, whether indoor or outdoor on the round roof terrace with magical views and insights, in the midst of spectacular lava landscape, you will experience unforgettable days. Our Slow Flow Yoga Retreats are personal training for individuals, couples and mini groups. We do not offer group retreats. For spontaneous bookers, the personal training is recommended. The yoga class is individually tailored to your needs. The exact dates can be individually adapted to your travel plans, so you can still plan hikes, bike tours and excursions. From Monday to Friday we hold daily 90-minute sessions of yoga and meditation; Suitable for beginners, advanced and yoga teachers, individually tailored to your needs. With Yogi Techniques, as Yin Yoga, Yoga for the Fascias, spiral dynamic… we improve our metabolic system, our nervous system, our body-posture and the energy flow of our meridians/Nadis. In this way we counteract the wear and tear, prevent herniated discs, and achieve a better body-posture and a better attitude. The 90 minutes Yoga Sessions are structured in a way, that all organic systems get the right attention. Suffering spinal and joint pain Annette Harnisch recommends 10 private sessions, for which she will compile an individual exercise program. Is both, holistic body therapy and body-oriented psychotherapy for the treatment of physical and psycho-emotional tension patterns. Body coaching is far superior to talking therapies, as we can deftly bypass the mind. A synthesis of various body-therapeutic and energetic methods such as Feldenkrais, Biodynamic Craniosacral Osteopathy also known as Ortho Bionomy, Entanglement, Reconnection, Quantum Healing, Body Coaching, Energy and Breathing work. It opens the way for healing to occur. Mindful touch, which touches the whole person and his soul through the body, brings light into the darkness, brings your own awareness into each cell of your body and thereby dissolves traumas stored in the body. Alone the careful touch leads you into deep relaxation up to transpersonal experiences, into your inner SPACE, in which healing happens. Blockages are solved. We integrate, balance out chakras and balance the life energy. In this way, old emotions that are still stored in the body or the aura can be dissolved and thus create space for the free flow of the life force. All the obstacles and resistances between you and the free flow of life energy have given space for healing insights. The body enters a state of deep relaxation, which also allows the soul to let go. Negative thoughts and feelings can give way to healing knowledge. to the source of our power and vitality, is restored. From Monday to Friday you have a daily 90 minutes. Session body coaching and systemic emotion coaching alternated as needed. You can make your stay mostly flexible and individual. This offers you space for relaxation and no time stress. On the weekends you have time for longer hikes and excursions, also to magical places of power of La Palma. You can also book this retreat without accommodation. at Casa Saraswati, or in another house on La Palma. You can also book this retreat without accommodation. will be dedicated to your well-beeing. to relax, and to allow the natural process of healing to occur. while allowing Grace and Infinite Wisdom. and ill regard you and your journey as sacred. Lomi Lomi bodywork uses lots of dancelike, flowing forearm strokes which wash freely over the receiver’s minimally draped body in a way frequently compared to ocean waves. This particular Lomi Lomi style is known as Temple Lomi. After a Lomi Lomi massage you will feel like you have been reborn. This traditional Temple massage is characterized by gentle stretching, dynamic massage of deep tissue, conscious touch, awareness, Rhythm and Stillness. Powerful but at the same time gentle. For a complete “Lomi Lomi nui Kahi Loa Energy massage and –Balancing with shells or Crystals”, which can cause a profound healing you need to have at least two hours. Since 1993 Annette Harnisch is a licensed Hawaiian Healing Practioner. 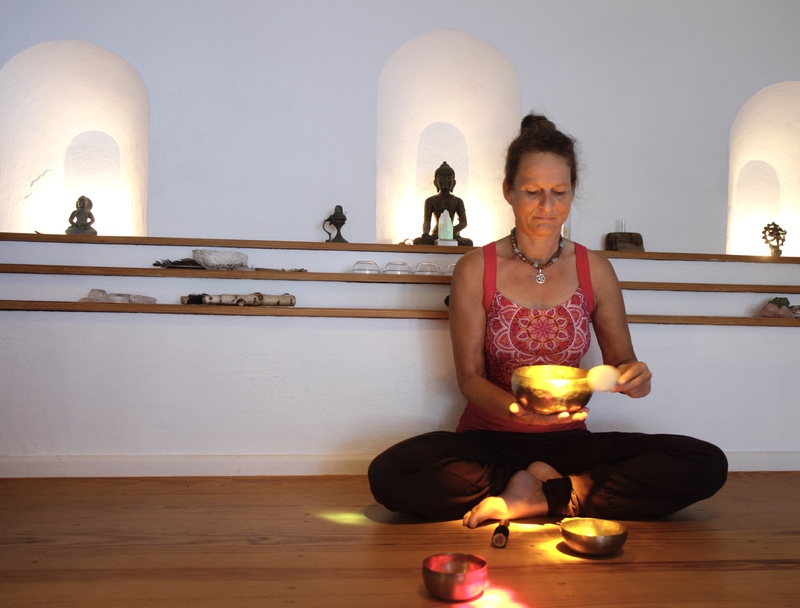 Do not miss this ultimate-La Palma-Healing experience! Transformative Bodywork – A Lomi Lomi inspired massage with hot lava – olivine stones, therapeutic conversation, energy balance with lava stones and matrix crystal healing. The Magic Lava Lomi definitely is not a Spa hot stone massage! 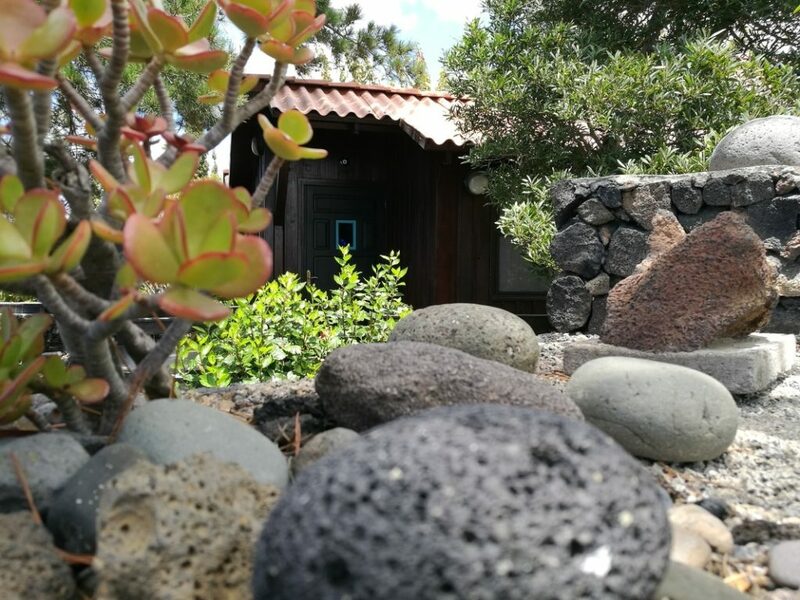 A Lomi Lomi – inspired massage with hot lava stones from La Palma warms up your soul, removes blockages and can act as deep healing. Due to the presence and caring intention of the energy therapist, this massage reconnects you again with your essence, with the source of your power. This flowing, stroking, kneading massage actively stimulates the blood circulation and lymphatic flow. Releasing tensions from the body, the energy field is noticeably more balanced, and it helps you to free your mind. 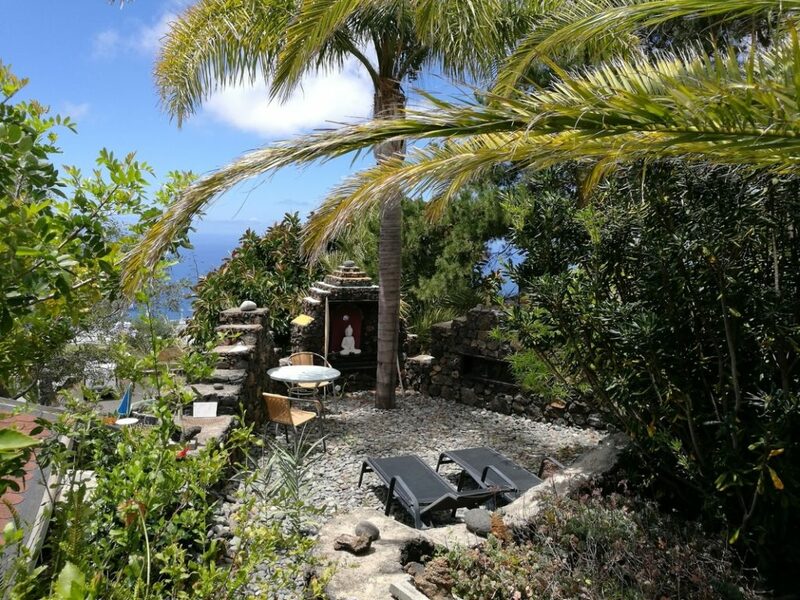 Are you ready for transformative Temple Lomi bodywork in the Buddhacasa on the volcanic island of La Palma? You need to book 2-3h. This includes a therapeutic conversation, maybe a Hooponopono, program the lava stones with your request, Energy balance with crystals and 15 minutes of resting time. A Retreats whith 5 Ayurvedic Yoga Massages is a good alternative to the real Ayurveda cure because of its healing effects without elaborate preparation. Ayurvedic Yoga Massage combines traditional Indian marma point massage and assisted yoga-based stretching therapy. An individual session of Ayurvedic Yoga Massage is given on a Shiatsu mat, but also possible on the massage table. Both hands and feet are used in the delivery of massage. The treatment involves alternation between deep tissue massage and a series of stretches covering all regions of the body. Therapeutic stretches, mobilisations and other healing techniques are applied according to clients’ needs. Gradually, a sense of presence and awareness is brought to the receiver. Another unique tool of the massage is the use of powder like calamus, cinnamon, cloves, ginger which, when mixed with just a little oil, brings out the toxins from the body; the scrubbing and stimulating feeling awakens the skin and improves blood circulation. An ayurvedic massage requires that you allow 10 minutes rest time for the valuable oils to enter the deep tissues. We will need at least 90 minutes to 2 hours for a session of Ayurvedic Yoga Massage. … a moving journey to yourself in the mirror of nature! At chosen places of power on La Palma island! Learn how you can find answers to your important questions in life with the ancient ritual of Medicine Walk in nature and draw new strength. On the medicine hike, you consciously enter with your question into nature, where we can cleverly sail around your mind as you are also connected to your very own nature. Depending on the season and the weather I am looking for different places of power that I have tested myself in the last 20 years. We visit exquisite places of power of La Palma island which I was allowed to try in the last 20 years I live here. I deliberately choose locations or times when we would not be disturbed by large hiking groups. So that we will have enough SPACE and STILLNESS and loneliness to Be, for STALKING and DREAMING, for loud singing and drumming. At the starting point we start with a small purification ritual, invite the forces and nature beings and ask for a successful Medicine Walk. Then we practice in mindful walking, we open all our senses, connect with Mother Earth and our True BEING. At chosen power locations, each participant lays a medicine wheel or is found by a tree, FLOWERING TREE CEREMONY for his personal vision quest. Then we share our experiences in the group, but you keep something for yourself, ground us with food and go back to the cars in SILENCE. The entire Canary Island of La Palma is a biosphere reserve. 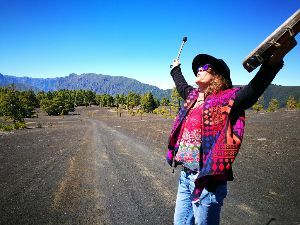 As a freshly baked shaman / nature coach, Annette Harnisch came with a group in 1997 to the magical island of La Palma. Since then she keeps going with growing enthusiasm to natural power places for her personal vision search and also with groups. Meanwhile, she had a moving journey to herself behind her and arrived in her power and on her place. She loves to share the appropriate places of power and the many tools for self-knowledge with island guests. She works as a self-employed naturopath, systemic coach, osteopath and owns the Buddhacasa La Palma. We meet at the petrol station „Gasolinera Shell El Paso“ and then drive together to the starting point of the medicine hike. I was really more than ready for vacation and had first booked a yoga retreat. On the spot Annette took a lot of time for me and put together a personal yoga program for me and my situation. Surprisingly efektiv I felt the 3 body coaching sessions. Not only that I felt pleasantly relaxed and energetic after the bodywork. With the discussions and the inner image work she led me directly to the causes of my emotional disbalance. 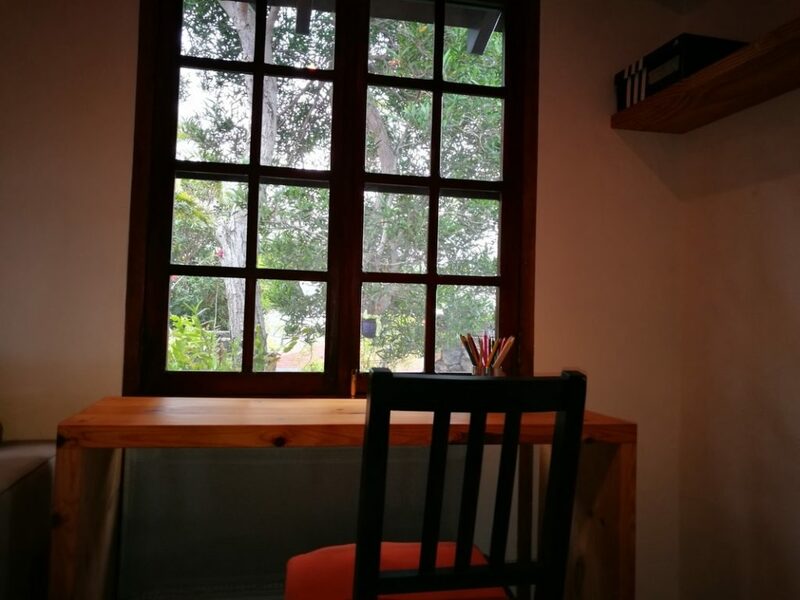 I will come back for sure and then I will book in time, so that I can stay in the beautiful Casa Saraswati. I had a fantastic retreat with Lomi Lomi massages. It was really a gift. I had a deep and quiet sleep after the first lomi massage. And also the pain in my shoulder is less than before. After the 3rd session my frontal sinuses became free too. I myself am a trauma therapist and psychotherapist and wanted to book a massage retreat first, then became curious about the body coaching and then took the version with the crystal healing of 2 hours. All previously booked by phone, for the Casa Saraswati I was too late. Lutz and Annette were excellent hosts, we felt very welcomed and enjoyed our stay very much. We can only recommend this wonderful retreat with Lomi Lomi Massages & Balinese Massage, its a very quiet and peaceful place. We felt completely recycled afterwards. We had a nice week at Casa Saraswati ! The house and the associated garden are gorgeous, you even have a view of the sea from the bed! From the beautiful terrace you can watch great sunsets. It is actually very quiet there and it is advisable to have a rental car to get to the house. You can start from there some beautiful hiking trails and Lutz is in this regard with good advice aside. We can recommend the accommodation in any case! We felt very comfortable in the 2 weeks of our stay. Fortunately, we were invited to the International Yoga Day. 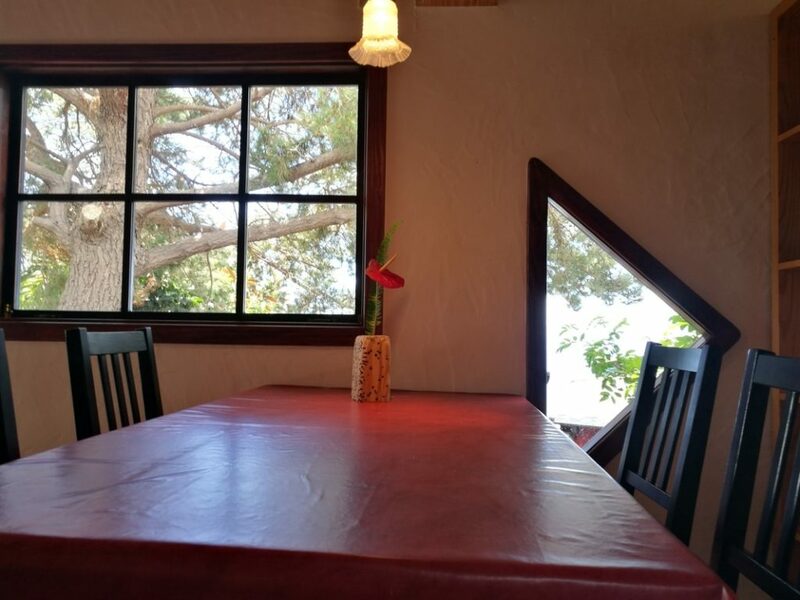 The house is very clean and tastefully decorated with lots of wood. It is actually a great climate house, always pleasantly tempered and nice and cool in the bedroom at night, so you sleep well in the raised, spacious sleeping niche. We had great sea views and sunsets. In the mornings you can enjoy breakfast, possibly with a sweater, because depending on the weather a cool wind can blow. If you like it warm and windless, take a seat in the small Buddha garden, where the many stones store the warm sunshine during the day. 2 sun loungers complete the sunbathing area. We had already got to know and love the healing hands of Annette during many of our La Palma vacations. As a result, I convinced my husband and we returned to Casa Saraswati in May 2018 to do an individual yoga class for two. Annette has really responded to our needs individually and now we are practicing yoga together again at home, with growing enthusiasm. It was as always very relaxing – even though we are going through a challenging time – again I can only say thank you – for the enlightening conversations and the conscious yoga. The yoga classes were great and also the massages, Annette Harnisch has golden hands. At Casa Saraswati we felt right at home, so creative and tastefully decorated and this beautiful garden. As you can see, we have become regular customers. There you can leave the stress of everyday life behind. 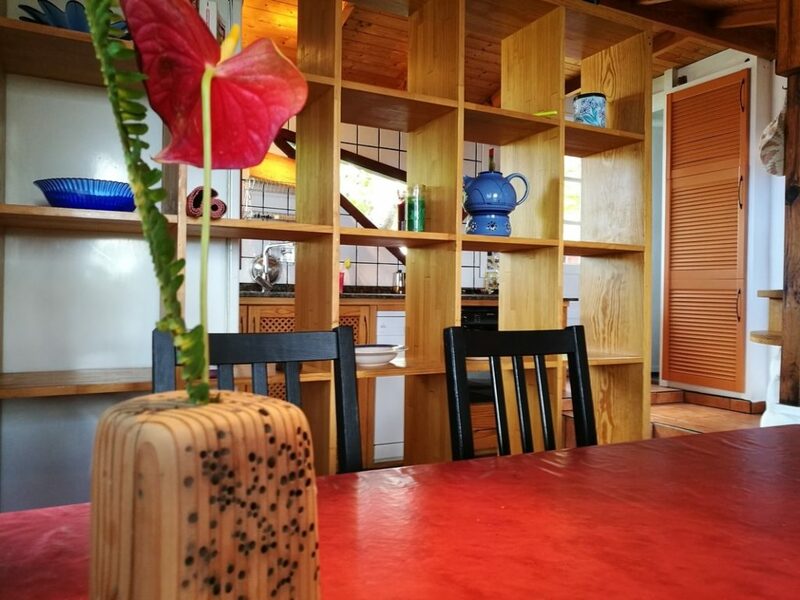 Beautiful, cozy apartment with Buddha garden and sea view, very quiet and super equipped 🙂 I enjoyed attending a yoga mini group, it was in English. And really an enrichment for my yoga practice – many things were really new to me, even though I’ve practiced yoga for a while. My friend had enough space on the wooden deck for his Ninyuzu exercises. We had a perfect holiday! 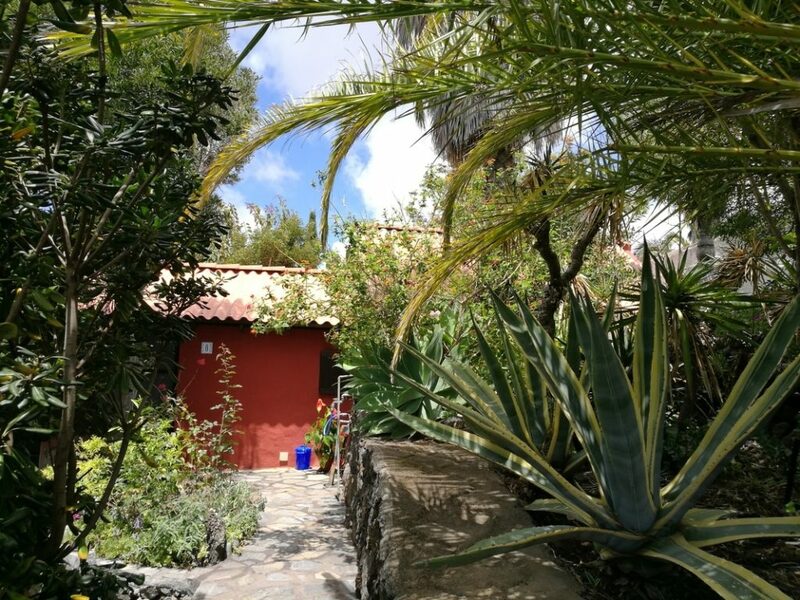 The location of the house is great, super quiet and central (by car, but also the first four days on foot it went well), the garden is very very nice and the house is optimally cut and totally tastefully decorated, we got away from first moment felt at home. The communication with the hosts is clear and friendly and also the offer of the Buddha Casa right next door is highly recommended. The body coaching sessions were very productive for both of us. We will come back for sure. For people (couples) who are looking for time and peace and as a starting point to explore the island, we can hardly imagine anything better! 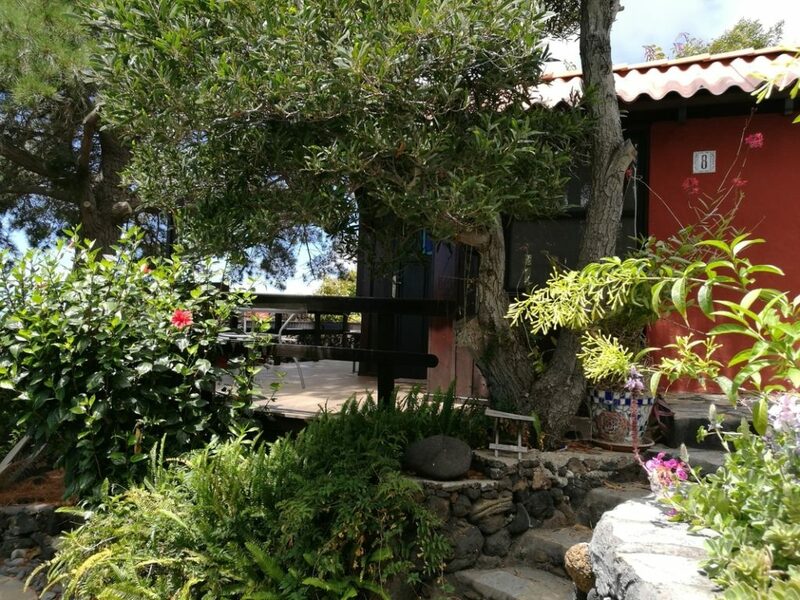 I think that will be my favorite house on La Palma … two weeks on our favorite island – two weeks of pure peace and relaxation! 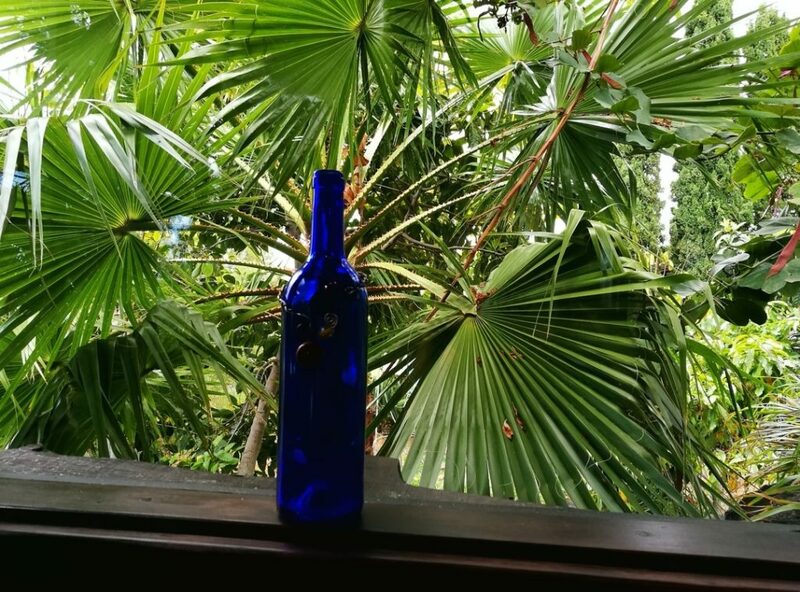 We have enjoyed the time with you – the fantastic view of the Atlantic Ocean, the company of the kittens, the great vegetation – and as we already knew before the Casa Saraswati – we have been enjoying the osteopathy treatments and massages by Annette for 10 years years. Everything great! I knew the excellent work of Annette from other La Palma vacations. In April 2014, I did a body coaching retreat alone with Annette and stayed at Casa Saraswati. Yes, it was wonderful and the body coaching still sounds like …. thank you for all your support and generosity in Buddha Casa. I was in good hands every moment and could feel at home at Casa Saraswati. Nevertheless, I had enough privacy. I do not always know that when traveling. Annette offers you whole body and spirit care through an integrated approach by opening a safe space where you will feel held by her strong presence and calm state of her being. 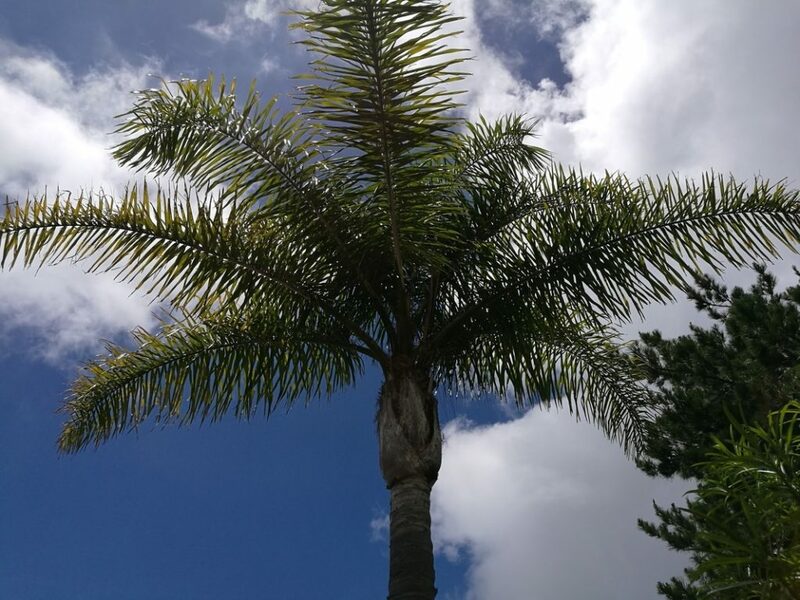 Annette Harnisch, as a professional Naturopath and Energy Healer facilitates a variety of therapeutic techniques such as Body Coaching & systemic Coaching, Hawaiian Healing & Ayurvedic Massages, Craniosacral & Shiatsu bodywork.